When, or if, you watch any races from the Daytona International Speedway this week, take note of an 70-yard-wide, crescent-shaped strip of grass between pit lane and the start-finish line. This is the “football field,” in part because games were played there in the past. And, here comes the fun part: Daytona would love to have football there again. Before Daytona International Speedway completed a $400 million makeover three years ago, Joie Chitwood III, then the speedway’s president, envisioned football games being played at Daytona, as a few had been after the speedway opened in 1959 and again in the 1970s. Chitwood’s bold idea drew some attention, then faded away. But that does not mean Daytona has forgotten about it. Many football fans are NASCAR fans, and vice versa. Interest in stock-car racing has dwindled in the last decade, and racetracks are trying to be come up with creative uses for their facilities. Motorcycles take over Daytona in March, another NASCAR race is held there in July, and sports cars roam the place in January. The Daytona 500 and those motorsports events still reign at the speedway, but the idea of a football game there has been just too good to let go, especially after Virginia Tech and Tennessee played a hugely successful football game at Bristol Motor Speedway in 2016. Bristol, on the Virginia-Tennessee border, is a half-mile track surrounded by an enormous bowl of grandstands, and attendance was 156,990, breaking the NCAA single-game record by about 500 miles. Tennessee won with ease, 45-24, but the event was a spectacle. Daytona is a monstrous 2½ mile tri-oval that is fronted by sweeping grandstands only between the fourth and first turns, so the wow effect on television would be different. But the sheer size of Daytona, coupled with its fame, would make a football game there really fun. 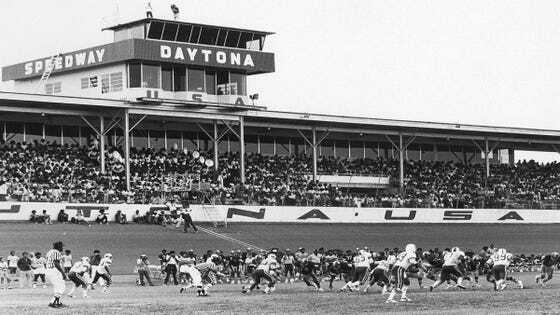 The “football field” at Daytona played host to a couple of high school football games after it opened in 1959. Bethune-Cookman, a college in Daytona Beach, later played four games at the speedway, drawing 32,000 for a 1974 game against Florida A&M. Bethune-Cookman has played its home games for 30 years at nearby 9,600-seat Daytona Stadium, which also has hosted high school and lower-level professional football games. But the speedway is not all that busy early in the football season. The speedway has added several events, including a music festival, a holiday lights festival, the Ferrari World Finals and an international triathlon in December. But Daytona could handle a football game, because it handles the Daytona 500. And it has lots of lights. There is also plenty of room in the infield for campers and tailgaters. Additionally, suites and hospitality could be available to big shots along pit lane — on the other side of the football field from the grandstands. College football is a natural, but the NFL could play there, too. The only drawback: the seats at either end of the main grandstands at Daytona would be pretty far from the field, so there is no guarantee that all tickets would sell to create a breathtaking scene like the one at Bristol. But it is worth a shot. All that is needed: two teams with an open weekend and a desire to gain some publicity and make some money. Maybe one could be Central Florida, an hour away in Orlando, just coming off a breakthrough season. Just spitballing here.